North Mankato, MN – (Jan. 30, 2019) – Nominations are now open for the Sherman Awards for Excellence in Patient Engagement. The Sherman Award, which is sponsored by EngagingPatients.org, Taylor Healthcare and the Institute for Healthcare Improvement/National Patient Safety Foundation Lucian Leape Institute, recognizes the best projects and programs in patient and family engagement from around the world. The nomination form has been simplified to make it easier and faster to nominate. The Sherman Citation for Excellence in Pediatric Patient Engagement will be awarded to a pediatric facility excelling in patient and family engagement. Established in 2014, the Sherman Awards recognize innovative work that has resulted in better, safer care and improved outcomes by engaging patients and families in their care. 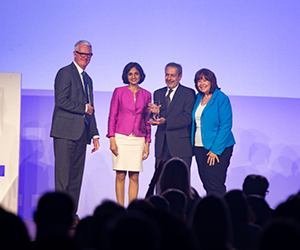 The award will be conferred at the IHI/NPSF Annual Patient Safety Congress in Houston, Tex. on May 16. The winner will receive an all-expenses paid trip to Houston for the Congress. Programs and projects will be judged on the degree to which patient and families are involved in project design and implementation; measurable results; sustainability; and the ability to replicate the project. Nominations will be accepted through March 8. Work must have occurred between January 1, 2018 and January 24, 2019. We’re partnering with Keypoint Intelligence to help you find resources to develop a cohesive communication strategy that breaks down operational silos. Taylor Communications has been ranked the highest U.S.-based sustainable printer in Canopy’s 2018 Blueline Ranking, the only comprehensive assessment of the environmental performance of North America’s printers.